I have given up tucking in shirts, my menopausal waistline does not look or feel good when too much is stuffed into an already snug waistband. I fondly remember attempting slender silhouettes such as Gertrude Vanderbilt Whitney’s above, with her lovely linen shirt tucked artfully into wide legged linen trousers, but life is too short to get morose about such things, so I’ve moved onto shirts that can be worn over waistbands rather than under, which is trickier than you’d think. The key is in the length and a well finished hemline. I found a few good ones in the newly refurbished Max Mara on Bond Street here in London, where every shopper seems to get a glass of prosecco, so if you are in need of a pick me up, do pop in. 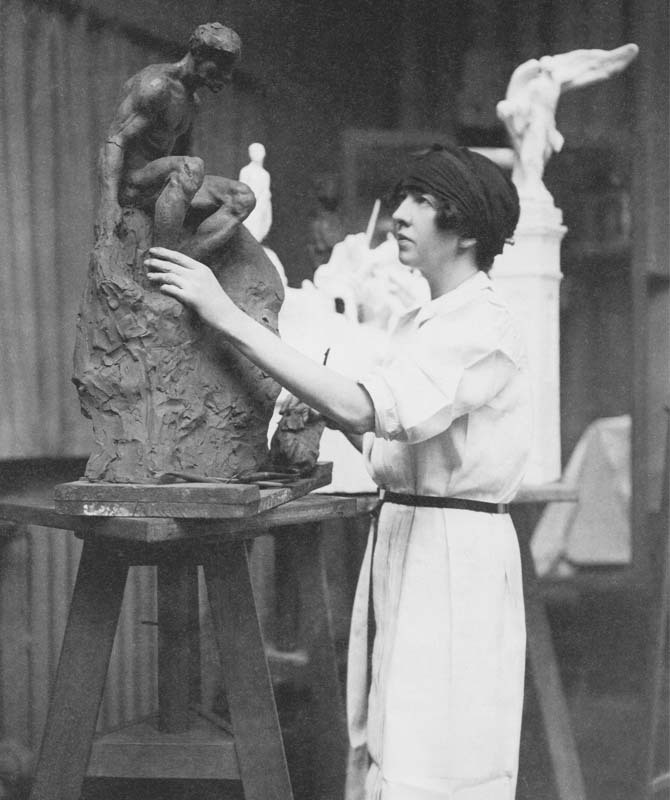 The image of Gertrude in her sculpture studio comes from the brands Spring magazine. 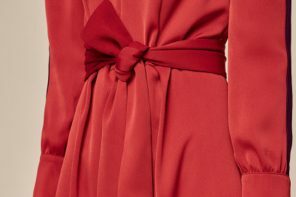 I’m a big fan of Max Mara, the quality is exemplary and although it might not be the most cutting edge brand on the planet, it does very polished classic coats and tailored separates. 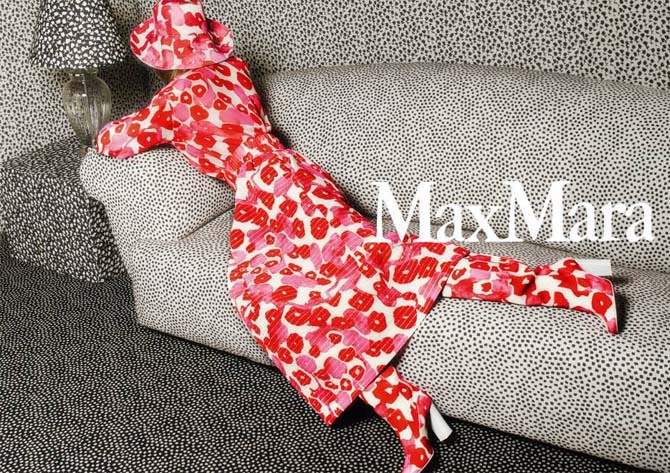 I like the current marketing campaign, below, and always feel that if I dressed in Max Mara top to toe, some of that Italian classic-chic magic might wear off on me and I’ll look like Tilda Swinton did in the wonderful film I Am Love. We can all dream. Anyway, back to Bond Street, where I discovered the white shirt collection. I didn’t know about this and the new store lay out gives the extensive variety of styles plenty of space and attention. 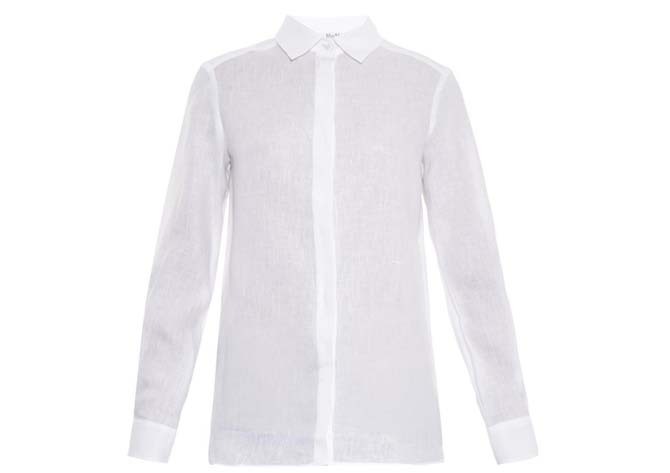 I’d recommend checking it out if you have a need to invest in a lovely white shirt. 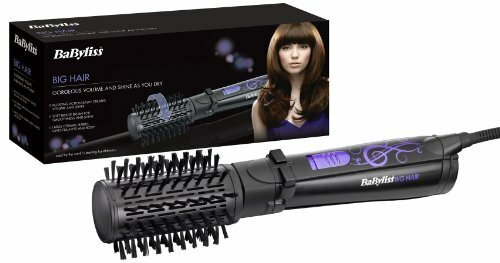 The range has a few excellent shapes, but annoyingly these aren’t showing on the website, as the store carries one-offs and limited editions to tempt you to visit. 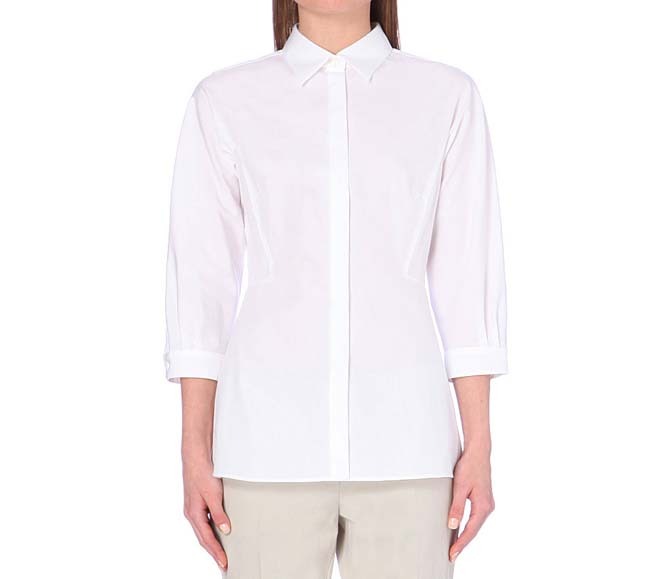 The Max Mara classic linen cicala shirt (which young Gertrude could in fact be wearing) is a good one with a covered button placket and is carefully squared off at the hem. 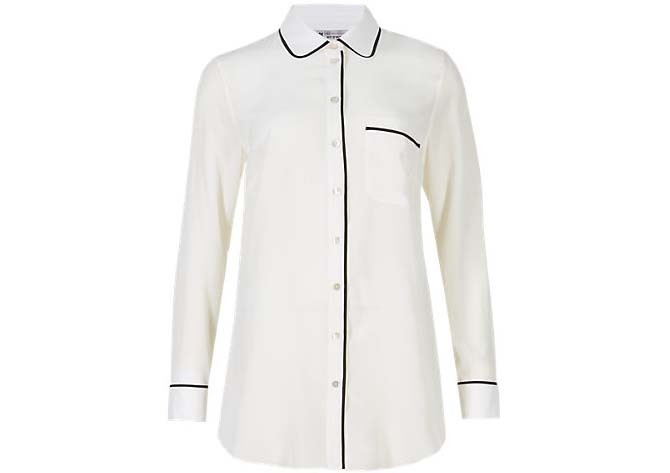 I also tried on the more shapely poplin cotton shirt, below, which sits well over lumpy waistlines, but my favourite was a generously wide tunic style shirt that had an artist-in-action loose fit feel to it, which I can’t show you as it’s not online. 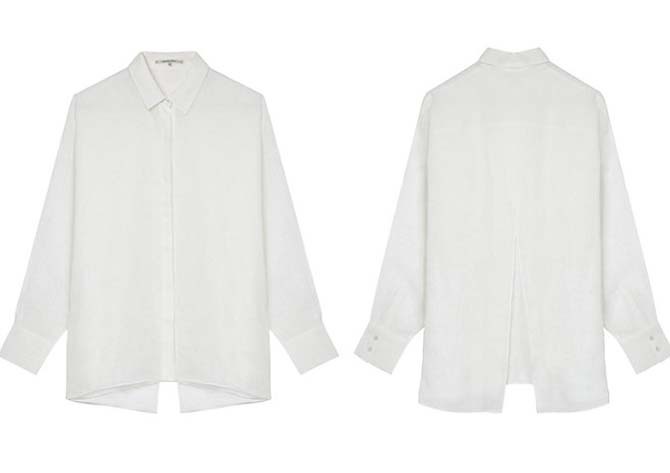 Since there’s not enough Max Mara to show you here, I’m including a great linen Adonis shirt I saw in Liberty by Gerard Darel, I loved the sliced-open back detail. Once you get your head around this oddly contemporary opening, it’s really very useful and gets over the non-tuck-in-able issues nicely by making a feature of the back. A camisole underneath is advisable for all but the most flamboyant. 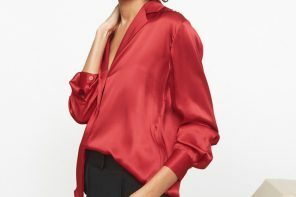 Worth checking too is our favourite bit of the Marks & Spencer collection- and no it’s not that over-talked-about suede skirt – the Best Of British collection, where there’s an excellent silk shirt, with navy tipping on colour and cuffs and a properly finished hemline. 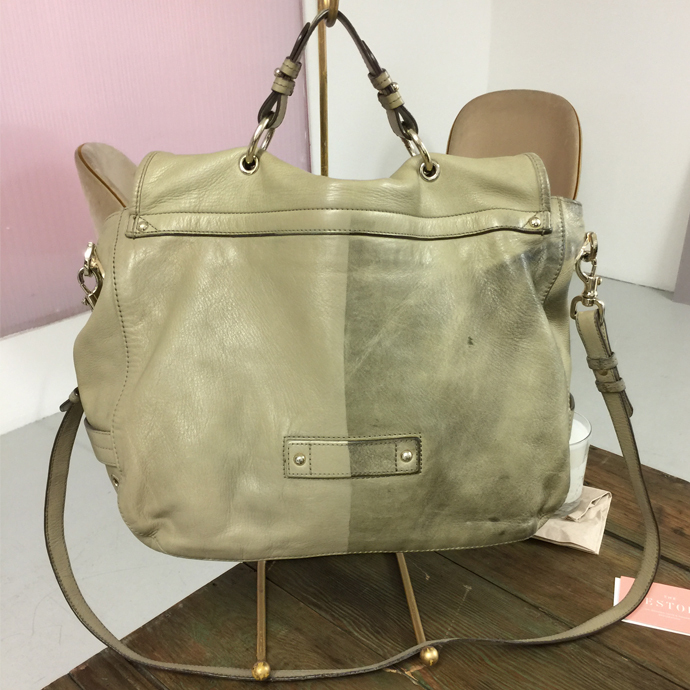 I love all the clothes you’ve suggested – however am sadly not in financial bracket to be able to pay £150 -how about styles for the less affluent?